If you’re a smoothie lover, you likely know just how much of a hassle it can be to whip one up. You have to plan in advance what kind of smoothies you’d like to make so you can pick up the ingredients at the store. Then, you have to wash and chop all of your produce to get it ready for blending. There are a number of steps that go into making the perfect smoothie but who has the time? Sometimes you’ll even bail on fixing a smoothie in favor of something that’s faster, easier, and takes less effort. And more often than not, that simpler choice isn’t always the healthiest. So, why not make it a little easier for yourself with a smoothie delivery service. 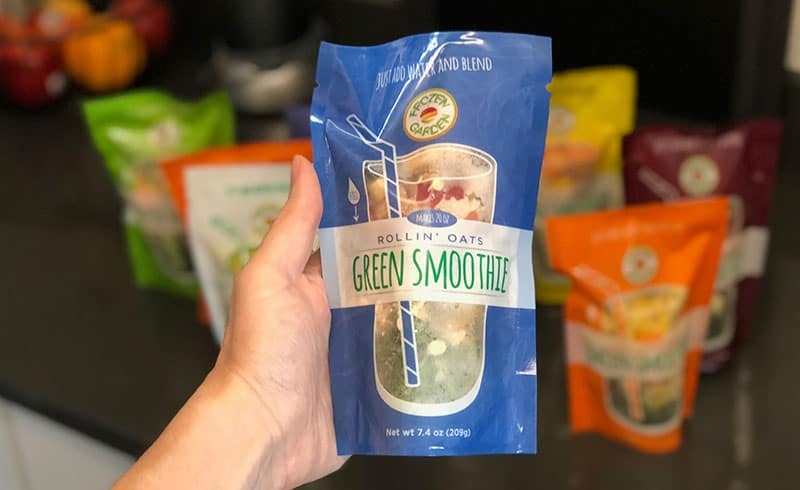 With pre-packaged smoothie delivery service, everything you need to create a delicious smoothie in your own home is in one convenient pouch. That means you don’t need to deal with the hassle of preparing ingredients. Even better, you also don’t have to hit up the local smoothie joint and pay a premium for their drinks. That means less time wasted and more money in your pocket. One of the great things about Frozen Garden is that you don’t lock yourself into any weekly or monthly shipments when purchasing from them. Instead, you can log onto their website and order your favorite smoothie flavors whenever you need to get your fix. Simply add your favorites to your virtual shopping cart, check out, and they’ll be on their way to your doorstep! On the other hand, those of you who are located in Indiana, Illinois, or Michigan are in for a treat. There are actually a number of stores across those three states that sell Frozen Garden smoothies. If you’re near one, all you have to do is stop in and stock up on your favorites in person! To see if you’re close to one of the stores that carries Frozen Garden products, check out the store locator on their website. You also have full access to their range of smoothie flavors. You’ll never be limited to what they have on the menu that week. Plus, they sell protein boosts for those who want to add a little something extra to their daily smoothie. You will want to keep in mind though that Frozen Garden has a minimum order amount of $35. It’s worth noting that each smoothie starts with a base of dark, leafy greens. They also contain real fruits, vegetables, seeds, and spices to provide you with healthy omega-3 fatty acids and nutrient-rich superfoods. All of the fruits and vegetables are picked at peak season, then they blast freeze them to maintain flavor and nutrients. There’s never any added sugar or chemical preservatives, meaning you can feel good about what you’re drinking. Plus, each smoothie is dairy-free, gluten-free, non-GMO, soy-free, and vegan. And the best part is that all of the ingredients are sourced from local farmers. As mentioned previously, you can also add some protein boosts to your cart if you need additional protein in your smoothies. The available options include their Protein Power 4, Pea Protein, Hemp Protein, and Chia Protein. A scoop of one of these in your smoothie will make it the perfect post-workout treat! 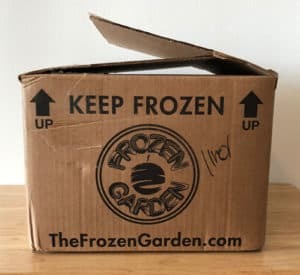 If you’re interested in placing an order with Frozen Garden, you’ll first want to make sure you’re within their delivery area. Currently, they deliver to all of the 48 contiguous United States. Unfortunately, that does mean they’re unable to ship smoothies to Alaska and Hawaii at this time. As mentioned before, there will be a $35 order minimum due to the logistics and cost of shipping frozen items. Orders are shipped out every week on Monday via FedEx Ground. That means if you place your order by midnight on Sunday, you can expect your tasty smoothies to be shipped out sometime on Monday. When your order arrives will depend where you live, but you can expect it to land on your doorstep between Tuesday and Friday. Frozen Garden only ships on Monday to prevent packages from getting stuck in warehouses during the weekend. This would result in a lot of thawed out, mushy smoothies and tons of unhappy customers. Just make sure you order by midnight on Sunday to get your smoothies sooner. When placing your order, you can get half-off shipping costs for purchases over $75. You will receive free shipping if your order is more than $125. Frozen Garden is committed to using environmentally-conscious packaging for all of their orders. The insulated liner you’ll find within your box is made from natural mineral wool, dirt, and rocks. When you throw this out, the mineral wool fiber will break back down into dirt and rock over time, so you don’t have to worry about it contributing to waste. The cardboard box your order comes in is recyclable and can be left out with your curbside recycling facility. Frozen Garden has one of the most environmentally-friendly packaging designs we’ve seen when it comes to smoothie boxes. Inside your box, you will also find dry ice, which keeps your smoothies cold during transportation. The dry ice will be wrapped in paper and it’s recommended you place the paper-wrapped dry ice in a bowl. Then, put it in a well-ventilated area that’s away from pets and children. Give the dry ice time to dissipate, then you can recycle the brown paper it was wrapped in afterwards. Just make sure you never touch the dry ice with your bare hands. The smoothie pouches themselves are BPA-free and can be recycled with most residential recycling programs. All you need to do is check and make sure your local recycling center accepts #7 plastic. By taking that extra step to recycle the pouches, you can feel good about doing your part in reducing the amount of plastic in our landfills. As mentioned before, Frozen Garden sources their smoothie ingredients from local farmers to ensure the highest of quality. Whenever possible, they’ll get their ingredients from farmers that are within 100 miles of their headquarters. Since they work with these farmers regularly, they’re well aware of that farm’s standards and practices. This level of quality assurance helps to provide the best smoothies to their customers. Once Frozen Garden receives the produce, they blast freeze it to retain maximum flavor and nutrition. Since dry ice is used during shipping, you don’t have to worry about your smoothies thawing out or going bad before they’ve landed on your doorstep. Everything will stay fresh and cold, meaning you’ll be able to enjoy them as soon as they arrive. Just make sure you unpack the pouches and store it all in the freezer until you’re ready to whip up a smoothie. Frozen Garden states the smoothies will last indefinitely when properly stored in your freezer. For the best quality though, they do recommend making and consuming them prior to the “Best By” date on the back of the packaging. This is typically about six months from the date of purchase. Preparing one of these smoothies is very, very simple. Since everything is stored in individual pouches and is ready to go, you don’t have to wash and chop a bunch of produce beforehand. You simply need to grab a pouch, pour everything into a blender, add water, and blend it all up. Within a couple of seconds, you’ll have a delicious smoothie in your hand. And before you complain about how you don’t have a fancy blender, that’s not needed either. 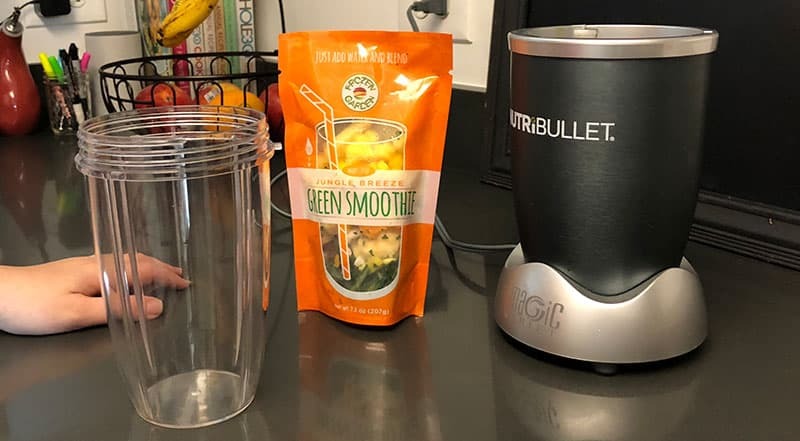 You can use any blender you have on hand to prepare your smoothies (we used a small Nutribullet for our review). While Frozen Garden recommends adding water, you could always add another liquid if you’d like. Almond milk is a favorite of ours when it comes to smoothies and should work beautifully with these pouches. It’s all about customizing them to your own preference! You can also add more liquid if you like your smoothie to be thinner and more mild tasting. Less liquid gives you a thicker smoothie with more of a robust flavor. And don’t forget, you can add your own protein to your smoothie as well. Frozen Garden has a number of options you can order from them. Now, let’s talk about how these Frozen Garden smoothies taste! After all, that’s going to tell you whether or not they’re worth purchasing. For those of you with a sweet tooth, you’re going to love the Berry Choco-Latte smoothie. It’s the perfect drink for someone who loves chocolate, but still needs that kick of espresso. It contains kale, banana, blueberries, raspberries, blackberries, a date, avocado, raw cacao powder, espresso powder, and Himalayan pink sea salt. It tastes great and it’s the perfect thing to get you going in the morning. Plus, you’ll love all the antioxidant benefits from the raw cacao. When cold and flu season comes around, you’ll want to stock up on Immunity. It has plenty of vitamin C, antioxidants, and electrolytes. Plus, the addition of cayenne pepper will give your metabolism a much-needed kickstart. This smoothie has orange, spinach, pear, lemon, date, avocado, hemp seeds, lemon zest, and cayenne pepper. It’s a tasty green smoothie that has a fresh, citrusy flavor. Another must-have is the Jungle Breeze smoothie. It contains spinach, pineapple, banana, orange, mango, kiwi, avocado, raw coconut, and a date. With superfoods, fatty acids, and electrolytes, you’ll be ready to take on the day after drinking this. And the fruity flavor will leave you feeling like you’re relaxing on a beach somewhere exotic! Who wouldn’t want that? 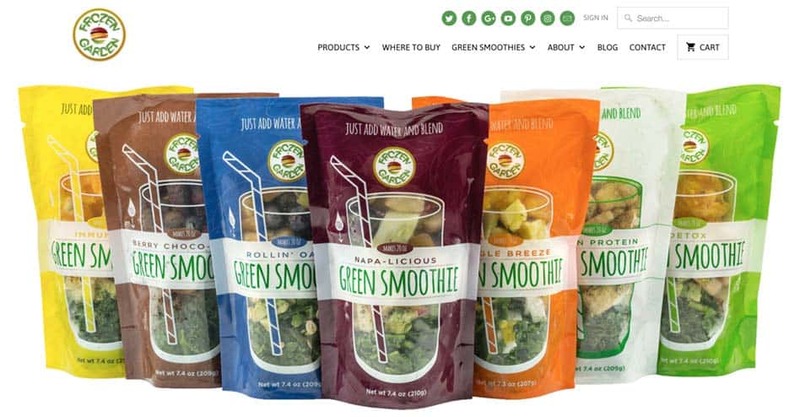 Each pouch will make a 20-ounce smoothie, which is a single serving for an adult. The full-size pouches will cost you $6.99. They do offer Junior Sizes of the Jungle Breeze and Rollin’ Oats, which are $4.99 per pouch. Sometimes you can catch your favorite smoothies on sale, which is a great time to stock up on your must-haves. Of course, you will need to keep in mind that Frozen Garden has that $35 order minimum in place. That means you’ll have to purchase at least six smoothie pouches in order to reach the threshold. Although, you can always add some protein boost to your order to help you get there, as those cost $5.99, $9.99, or $11.99 depending on what you purchase. For anyone who loves smoothies, but hates the hassle of making them, Frozen Garden is really worth checking out. 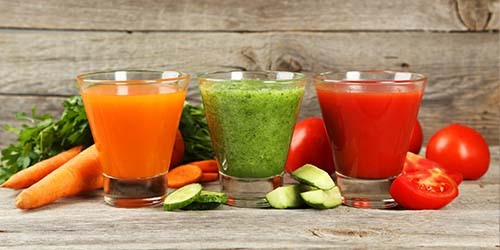 Although they don’t have a massive selection of smoothie flavors, they still have some great options that any smoothie connoisseur would love to have on hand. Plus, the additional protein boosts they have are a nice touch for those who need extra protein.